The Tables below will help you decide which unit will work best for you. 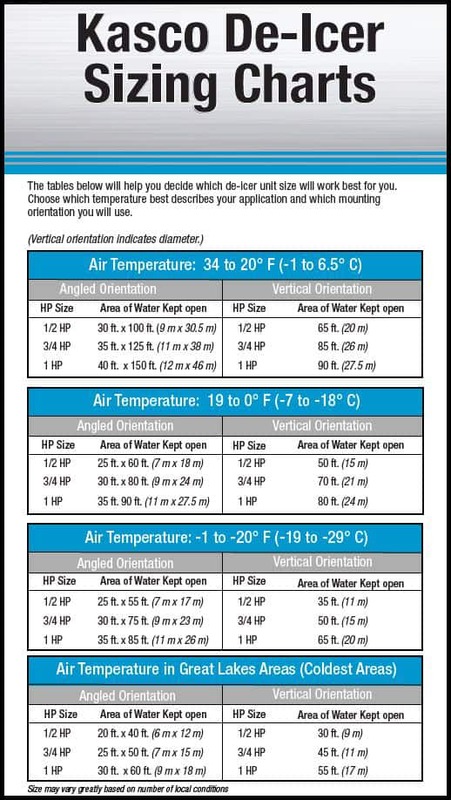 Choose the temperature that best describes your application and which mounting orientation you will use.The high-performance motors in the Kasco Marine 1/2HP 2400D, 3/4HP 3400D, and 1HP 4400D De-icer creates large amounts of water flow that will prevent ice formation and protect property from the damages of ice jacking and expansion pressure. Standard Cord length options of 25ft ,50ft,100ft are available but special orders for 150ft or more power cords available upon request. Contact us for a quote. Optional mounting systems including a Universal dock/pier mount, Industrial dock/pier mount, Horizontal float and Large Metal Frame Stand for shallow applications are available. The C-10 Thermostat and C-20 Thermostat/Timer controllers are also available to help you save power and improve your Kasco Marine de-icer’s performance.